Love key lime pie? 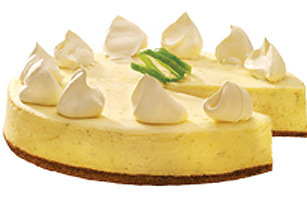 Then you will adore our Key Lime Cheesecake. Follow our 3-step method to cheesecake perfection. Preheat oven to 350°F. Mix graham crumbs and butter; press onto bottom of 9-inch springform pan. Beat cream cheese and sugar in large bowl with electric mixer on medium speed until well blended. Add lime peel and juice; mix well. Add eggs, one at a time, beating on low speed after each addition just until blended. Pour over crust. Bake 45 to 50 min. or until centre is almost set. Run knife or metal spatula around rim of pan to loosen cake; cool before removing rim. Refrigerate at least 4 hours before serving. Top with whipped topping just before serving. Store leftovers in refrigerator. To easily transfer chilled cheesecake from springform pan to serving plate, cover bottom of springform pan with parchment paper before using.